One Herefordshire agronomist has observed a lot of fodder beet crop canopies looking far less healthy than usual this autumn; a clear sign they will now be falling short of their yield potential. RM Jones agronomist James Oliver is a fan of fodder beet as an energy crop for livestock but says to get the most out of it, canopies have to be kept healthy until lifting. “This season there are precious few green canopies around due to a combination of early nutrient stress and foliar disease pressure later on,” he says. “The interveinal yellow mottling we are now seeing is the ‘speckled yellows’ symptom of manganese deficiency. It is made worse by dry/droughted soil conditions, as we had this spring, and may show as early as the two-leaf stage. It can easily be addressed at the same time as the routine boron foliar feed goes on. While this has been something of a seasonal ‘lesson learned’, foliar disease is an every year problem that few growers consider. From this point on foliar diseases is the main threat to crop potential. In Mr Oliver’s opinion growers could have gained an extra 20-25 per cent yield this year by using fungicides and maintaining green leaf through what has proved to be a fantastic autumn for growth. The 2016 sugar beet crop survey recorded more than 90 per cent of growers applying fungicide(s). A quarter applied once, over 60 per cent applied twice and 5 per cent added a third. Typically the first spray goes on at the first sign of disease – usually late July – and a second is applied four weeks later to crops destined for October lifting onwards. 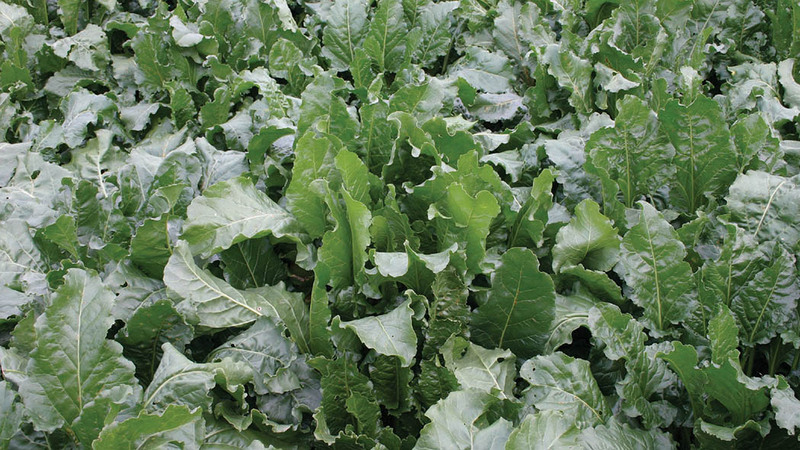 A two-spray fungicide programme in sugar beet crops typically delivers a 13 per cent yield increase, according to the BBRO. Long-term trials conducted by Bayer with beet fungicide Escolta (cyproconazole+trifloxystrobin), for example, also show an average 13 per cent yield increase from a two-spray programme across seasons with disease pressure ranging from low to high. “If you are currently averaging 70 tonnes/hectare and value your fodder beet at £25/t ex-farm, this could put an additional £175/ha on your bottom line. Well worth thinking about and certainly a big step towards the 100t/ha mark which really should be today’s yield target,” Mr Oliver says.